New York artist Evan Wilson was recently honored with the William Bouguereau Award, for Emotion, Theme and the Figure, in the 2006 Art Renewal Center’s annual International Salon. Founded in 1999, ARC is known as the largest on-line museum on the Internet and one of the Internet’s leading art resources. Attracting over 1,600 entrants every year, in twelve countries from USA to China, the annual competition’s principal mission is for the preservation and advancement of traditional art. 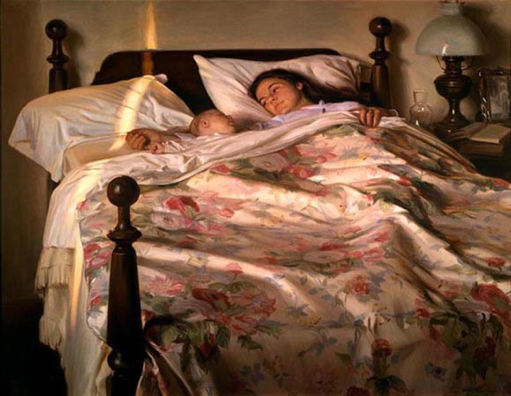 Wilson’s painting Anita and Elliot, shows a young mother in the early hours of the morning, with a sleeping infant on her arm. The painting is currently at the Jule Collins Smith Museum in Auburn, Alabama, as part of a traveling exhibition titled: “Legacy, A Tradition Lives On”. In addition to the Bouguereau Award, Wilson received a Chairman’s Choice Award for his painting entitled: Lillian. A third painting, Katherine was chosen to be among the top 100 paintings in the competition. Wilson lives and paints in Hoosick, New York.